size? is once again teaming up with Nike to release an upcoming “Safari” Pack. The first shoe to drop from their pack is the Air Max 95. 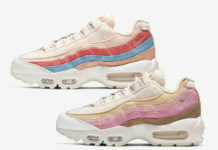 Their Nike Air Max 95 takes on a color palette from the original 1987 era Air Safari. It features a color combination of Black, White, Grey and the signature “Carrot” Orange. Finishing off the theme is the signature “Safari” print covering the entire upper. Look for the Nike Air Max 95 “Safari” to release on Friday, June 8th exclusively on the size? app and all size? locations.